(from Billboard Magazine, August 7, 2013) Using celebrities in advertisements is nothing new, but for RadioShack it’s a new adventure that’s paying off quite nicely. The retailer used Robin Thicke’s chart topper “Blurred Lines” in a recent television advertisement that ended up re-launching a hurting brand. The company, which is nearly 100 years old, is in branding mode. Under the supervision of CEO Joe Magnacca and Chief Executive Officer Jennifer Warren, the company’s marketing strategy is all about the music. In a campaign to inform consumers that RadioShack carries popular items, they are teaming up with musical artists in a considerable way. 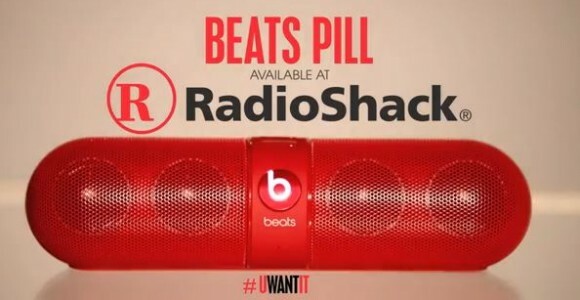 The new Pill speaker from Beats by Dr. Dre was the commencement of that campaign. Followed by the launching of another Beats by Dr. Dre product, this time featuring 2 Chainz, not only is the retailer using today’s current hits, they are also using platforms like MTV’s Video Music Awards to highlight their ads. This shift in demographic already seems to be paying off. RadioShack isn’t slowing down any time soon. Their next venture is the DECK campaign highlighting DJ Steve Aoki, Lil Jon, and duo Alexis and Fido. The duo didn’t hesitate when offered the gig realizing that national exposure takes their music into markets that have not been explored. Not to mention Olympic swimmer Michael Phelps joins the cast for the commercial. The retailer is using an advertising strategy that can’t be ignored. Musicians and athletes give RadioShack the brand recognition that it has been lacking. Entertainment is one of the best ways to sell a product, and RadioShack sells the devices to join it. So putting the two together is a win win for both the entertainers and the retailer.